Get a little taste of Boot Camp at your next event with the Camouflage 30' Obstacle Course. This 30-foot long inflatable obstacle course is designed for two people to go head-to-head in a race to the finish line. This will keep participants moving through the line quickly, and allow more people to get a turn on this fun and challenging course. This 30 Foot Obstacle Course offers a series of challenging physical activities including running, climbing, jumping, crawling and sliding. The Camouflage 30' Obstacle Course is ideal for birthday parties, military fundraisers and youth sports team parties. It features bright camouflage colors and is commercial quality, offering years of safe fun for children and adults. 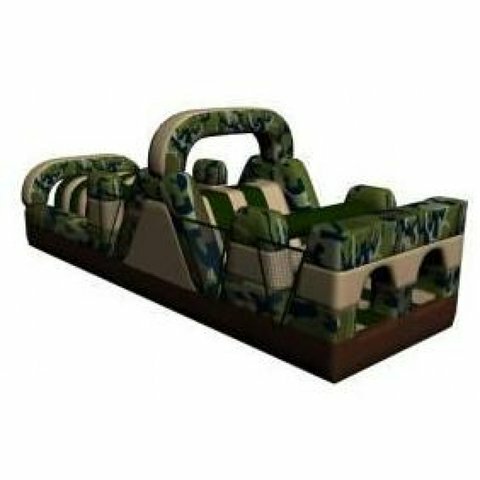 Pair this unit with our 7-Element Obstacle Courses or Rock Climb Slides to create an even more intense challenge.